Radiant energy is the energy of electromagnetic waves. Now, I am not a physicist. I don’t even play one on TV. 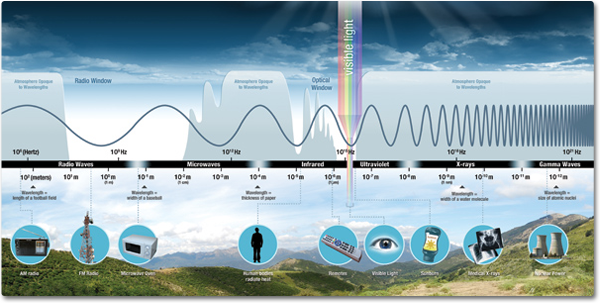 But, in my limited understanding, visible light is electromagnetic radiation that is visible to the human eye and responsible for the sense of sight. Further, I read that light moves at a speed of 299,792,458 meters per second (in a vacuum,) and, as I understand it, this fact is one of the fundamental “constants” of nature. The speed of light is one of the variables in Einstein’s famous equation E=mc2 which supports the idea that all the matter in the universe originates from indestructible energy. In physics, the term light sometimes refers to electromagnetic radiation of any wavelength, whether visible or not, and exhibits properties of both waves and particles. This property is referred to as the wave–particle duality. It is my understanding of science that we are immersed in a spectrum of electromagnetic waves (or fields.) These waves serve with other fields, like gravitational fields or sound waves, to bring order to the material world. More recent theories in quantum physics describe electrons in terms of waves. Waves can be described by their height (amplitude), length (wavelength) and frequency. Imagine playing with a long rope by holding one end and oscillating it up and down at different speeds. The shape of the waves in the rope…the amplitude, wavelength, and frequency together are known as the phase of the wave. Coherence describes waves that have a constant relative phase – that is waves that exhibit correlations in phase, shape, or form. Conversely, interference describes waves that have an inconsistent phase or a phase that is shifting. Believe it or not, this information is relevant to my thesis, and I am grateful for your taking time to follow along. Hang in there, I am convinced that it is time well spent. If you have 30 minutes you can watch this excellent video from NASA and learn more about the electromagnetic waves radiating through the universe.